The following Vendor Partners comprise the AGM Affiliate membership. Buying Incentives and special offers are offered by many of these Vendor Partners. Click here to view current buying incentives and special AGM offers. Products/Services: The 2UNDR™ products provide the best fit, comfort and style a man could ever need. Tagless, mid-rise, regular fit performance brief with Premium 1.25" roll resistant waistband, Signature quick access front fly, Patent-pending Joey Pouch™ for support and comfort No-Drip-Tip™ moisture control layer, Smooth, chafe-free flatlock seam construction. Made of Pure beechwood fiber modal fabric blend. Unparalleled fit and feel. Ultimate quick-dry poly elastane blends, new micro Nylon/Poly blends and much more Sizes: S - XXL. XS-5XL Available in NUMEROUS styles - THE SWING SHIFT™, THE DAYSHIFT™, THE POWERSHIFT™, THE NIGHTSHFT™, NEW TEE SHIRTS, HATS, SOCKS AND JOGGER SETS. CHECK OUT OUR NEW NCAA SWINGSHIFT MODELS IN 24 MAJOR SCHOOLS. Projekt™ high quality bags, luggage, backpacks messenger, toiletry, event/tournament programs. Products/Services: Luxury Italian made golf apparel. Products/Services: Abacus Sportswear, a pioneer of high-performance stretch waterproof fabrics, produces smart, technical clothing which combines Swedish design with quality and functionality, befitting the active golfer. Golf should be purely about the game, with no impediments or distractions - and is why Abacus Sportswear's clothes are designed to work and move in total sync with golfers, providing complete Freedom of Motion which, in turn, provides Freedom of Golf. Products/Services: Leading manufacturer of golf balls, golf clubs, gloves, bags and accessories under the Titleist and Pinnacle brand names. Products/Services: Ahead Authentic Men's Apparel, Ahead Headwear, Accessories, Kate Lord Women's Apparel and Event/Tournament gift packs. Products/Services: We manufacture a complete line of custom decorated golf headwear. Products/Services: AmericasMart is the largest wholesale gift and home furnishings market in the world! Products/Services: Anatomie is a lifestyle! Modern European designer sportswear using state-of-the-art French and Italian fabrications and details with European manufacturing. Anatomie is perfect for golf, travel, spa, fitness and more! Products/Services: We are a material driven, performance based golf apparel company that provides cross functional athletica apparel needs suited for everyday modern life. We are focused on providing differentiated products and services to cater to the ever changing demand of our clients. Products/Services: A full service lifestyle apparel company offering both men's & women's styles along with custom embroidery services. Products/Services: Providing the best in premium logo and/or personalized golf accessories-headcovers, towels, putter covers, pouches and much more. Order easily on line. Products/Services: We specialize in custom, hand-printed tumbled marble coasters, tournament gifts, awards and hole-in-one plaques. Products/Services: Barr Display offers free golf shop design and consultation services. Let us help you maximize your sales per square foot with our experienced space planning and fixture selection team. We can also design and build custom fixtures and we specialize in custom sales counters. As part of our full service approach, we carry over 3000 store fixtures and retail displays for every day shop usage. Most stock orders ship within 24 hours. Products/Services: The Official Clubhouse Furnishings and Golf Shop Fixtures of the PGA of America" designs and manufactures hand-crafted mahogany, rattan, leather and brass golf shop display fixtures, lockers, accessories and clubhouse furnishings. Golf shop planning services available. Products/Services: Bellemonde offers a spectacular tournament gift and items to sell in the pro shop. Great bags, golf & travel accessories for men and women. Products/Services: Belyn Key is a truly unique premium brand of lifestyle inspired ladies golf apparel that we created to cross over from everyday wear to the course. Belyn Key bridges the gap between what we have to wear on course and what we love to wear in life. Products/Services: Beth De Pass offers women an active lifestyle brand of golfwear that transitions effortlessly from the fairway to the clubhouse. Products/Services: The Court Haley collections (Sport Haley, Bette & Court and Slim-Sation) offer women's traditionally modern apparel, performance sun protection sportswear, women's second layer and outerwear and a full pull on bottoms collection. Products/Services: Trendy women's apparel for the active lady that loves golf and tennis. These chic skirts and shorts will move with you and pair nicely with our breathable sleeveless polo shirts as well as our cap sleeved polo. Birdies and Bows feature many vibrant prints that will be sure to catch your eye. Products/Services: Black Clover is a premium lifestyle apparel company. Black Clover offers headwear, polo's, t-shirts, belts and many other accessories to help your consumers "Live Lucky" at everything they do. Co-branding options are available on most products. Special offers available for a limited time. Call or email our friendly sales team today and join the Clover Nation! Products/Services: Blistex has been an innovative leader in lip care for over 55 years. Blistex manufactures, tests and distributes a full line of quality lip care products. New this year is Blistex Clear Advance, a Lip Protectant/Sunscreen with SPF 30. Products/Services: BloqUV is a sun protective lifestyle brand that blocks 98% of sun's rays. Our fabrics have moisture wicking/quick dry benefits and are used for golf, tennis, running, swimming, paddle boarding, hiking, biking and more. Since UV chemicals are not added to our fabrics the UV protection does not wash away with launderings. BloqUV fabric keeps you cool! All fabrics are tested by an independent UV laboratory wet/dry by color and batch. BloqUV is sold in over 700 locations nationwide. Products/Services: A collection of sportswear for men & women featuring the finest in quality & design from around the world. Products/Services: As world leader in homeopathy, our passion is your health. Our promise is your satisfaction. Since 1932, and now serving over 50 countries, as a pharmaceutical laboratory, Boiron has been committed to providing quality medicines. For the American golfing community, Boiron's ARNICARE line of pain relief products -- oral and topical -- provides fast, sure and safe relief. Regulated by the FDA, Boiron ARNICARE doesn't interfere or interact with any other medicines or supplements. ARNICARE pain relief options - cream, gel, roll on and tablets - are already preferred by savvy moms, gardeners, weekend warriors and baby boomers across the US, anyone with sore backs, neck, legs or feet. ARNICARE is recommended by doctors, pharmacists, plastic surgeons, and used by professional athletes. Visit www.boironusa.com for more information. Products/Services: Bugatchi Uomo Apparel offers a Men's Sportswear Collection of polos, wovens, sweaters, trousers/bermudas, outerwear and neckwear. Our products retail in better shops and resorts across the United States and Canada. Products/Services: Callaway® Apparel is the ultimate combination of golf authenticity and classic style. Always innovative, always an outperformer. Because apparel that offers quality, performance, functionality and fit is as important to both men and women golfers as the equipment they use. Callaway Apparel is designed for those who love the game of golf. It represents where the game has been, and where the game is going. Products/Services: Chase54 is committed to developing comfortable, stylish and affordable golf apparel that relies on state of the art fabrics and top quality technology in its production and design. Functionality, comfort and performance are integral to any piece of apparel we make, and Chase54 has the expertise and experience to offer impeccable style at an affordable price. Products/Services: The Club Management Association of America (CMAA) is the professional Association for managers of membership clubs. The objectives of the Association are to promote and advance friendly relations among persons connected with the management of clubs and other associations of similar character; to encourage the education and advancement of its members; and to assist club officers and members, through their managers, to secure the utmost in efficient and successful operations. Products/Services: CobraPuma Golf focuses exclusively on inventive technologies in drivers, fairways, hybrids and irons, which deliver improved performance to golfers of all abilities and fashion forward apparel and accessories. Products/Services: At Corkcicle, our fashion-forward products are inspired by modern design and rooted in social responsibility. Whether you're sipping cocktails or coffee, Corkcicle products were designed to help elevate the moments we share together on and off the course. Our unique and vast assortment of hydration, bar ware and cooler bag products make a lasting impression in the retail pro shop as well as memorable gifts for events and tournaments. Full color pad print and laser etch decoration available on most products. Products/Services: Cutler Sports offers Swedish designed apparel by Daily Sports at $60-$95 retail, European inspired designed bags by Cutler and many accessories available for corporate or member guest events. Products/Services: Cutter & Buck was founded in Seattle in 1989 and we have always been inspired to continuously improve the American sportswear experience for men and women. We continue to hone our true passion and purpose of creating easy, modern sportswear that must meet the demands of an active lifestyle - a perfect mix of timeless style and a genuine take on performance and functionality. Products/Services: Denise Cronwall Activewear is a feminine boutique-style line (Tennis, Golf, Fitness and Lifestyle) that has proven to be a hit within the style-conscious tennis Country Club clientele and now the eye-catching designs are available in a full golf line! The line is manufactured in the USA and is known and recognized for its luxurious fabrics and elegant details. Products/Services: DEVEREUX: Anatomy of Proper Threads- It takes a unique blend of performance and style to craft the ultimate in Proper Threads. A combination of cut and comfort designed to move how you move and live how you live. From design and fabric to buttons, collars and stitches, we put everything into our collection so you can get the most out of it. Products/Services: Divots has been serving the green grass and specialty markets for 40 years. Our labels include: Byron Nelson, Tourplay, Sope Creek or we will create your own private label program. Divots offers classic styling with many color palettes and private label capacity for club branding. We use the latest performance technical fabrics and 100% cotton mercerized fabrics with quick in-house embroidery and large inventory to service immediate customer needs. 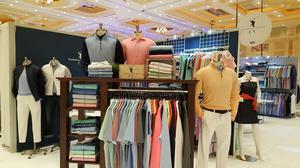 Products/Services: Established in 2008, Donald Ross Sportswear is the premier men's performance golf apparel producer. Founded upon the values and principles of golf course architect, Donald J. Ross, the company develops traditionally styled garments enhanced with modern performance fabrics. Distributing exclusively to the most elite and renown green grass golf clubs and resorts, Donald Ross maintains a controlled growth with emphasis on delivering top quality product and service to their accounts. Having expanded to over 1,000 national accounts and growing accounts abroad, the company continues to establish their unique presence in the golf apparel industry. Products/Services: DRIVE, an officially licensed product of the PGA TOUR is a high-performance collection of sun and body care from Caren Products. All products are packed with Aloe Vera, botanicals and anti-oxidant vitamins to deliver real results. DRIVE Sunscreens deliver broad-spectrum protection and were formulated with golfers needs in mind - no slip grip. Fragrance is neutral and appeals to all individuals.Our tag: Whatever you Play, Play Protected! Unique options for member guests or corporate gifts. Caren Products were originally formulated for patients undergoing chemotherapy and radiation to help provide relief and recovery from these harsh treatments. Helps restore, rejuvenate and replenish all skin types. Products/Services: ECCO is the luxury golf shoe brand leader. ECCO provides the highest margins within the footwear category, and ECCO golf shoes are preferred by Tour professional and discerning golfers. ECCO quality and comfort technology are second to none. Profit with ECCO. Products/Services: Eisinger Smith offers a complete line of custom metal and leather golf accessories with point of purchase display program and an extensive collection of tournament gifts. We feature custom logoed green repair tools, hat clips, ball markers, bag tags, money clips, leather wallets, valuable pouches and shoe bags. Products/Services: Sport specific hemp supplements. Products/Services: Summit Golf Brands creates the finest golf sportswear that enhances and enriches the lives of all golfers, on and off course. With our brands, all unique and innovative, we dedicate ourselves to authenticity, creating a wide spectrum of the highest quality clothing created for the game. Made in the USA! Products/Services: Premium Branded Sunglasses. Under Armour sunglasses are premium branded eyewear that offers value you don't see from the competition. We offer fantastic tournament packages without sizing issues. Products/Services: Fairway Charms creates logo golf charms for individual golf courses showcasing each club's unique logo. Fairway Charms are handcrafted in .925 sterling silver and proudly made in the U.S.A. Fairway Charms are the perfect way to collect and celebrate your passion for golf. Products/Services: FootJoy is committed to enhancing your on-course experience through the development of superior golf shoes, gloves, outerwear, socks and accessories. Our products exceed expectations in all weather and playing conditions through advanced technical innovation, performance, and supreme comfort. FootJoy is one of the brands that makes up the Acushnet Company. Products/Services: Foray Golf designs, manufactures and sells limited edition women's golf apparel. The company was founded in 2016 by fashion industry veterans who love the sport of golf. Our goal is to encourage and empower women to increase participation by providing unique designs that perform on the course. Foray is taking women's golf clothing where it has never been! Products/Services: Full Turn Direct provides high quality Luxury and Performance apparel to the best specialty retailers in the world. Our products, all of which are fully customizable to celebrate our customers own brand, can be found through the finest golf shops, resorts, men's specialty stores, professional sports franchises and universities. Custom Branding, which is the fastest growing segment in all of retail, is now available to the specialty retailer. We also provide a state of the art e-commerce solution enabling our customers to service their members, guests, fans and corporate partners online. Products/Services: Golf was born on the wind-swept links of Scotland and since then, golfers have respected the style established by their Scottish forebears. Rooted in this quiet tradition, the idea of G/FORE is a simple evolution: colour. G/FORE accentuates the green of the fairways with finely tailored style for the demanding player. Products/Services: GALVIN GREEN - WE NEVER COMPROMISE! Galvin Green is a pure golf brand specializing in the design and supply of high-performance clothing to golfers in more than 20 countries worldwide. Designed by golfers for golfers, every garment and layer has been developed to be compatible - providing exceptional comfort, freedom of movement and protection from the elements. Each detail exists because the game demands it and there is never any compromise on the quality of materials or the functional design of golf wear styled for all climatic conditions. Products/Services: Garb, Inc. is a manufacturer of children's golf apparel for ages newborn to 12 years, both boys and girls. Products range from high-end outerwear and performance polos to bottoms including a full line of headwear and t-shirts. Products/Services: Gator Made Golf works with all retail golf outlets to customize accessories like ball markers, bag tags, challenge coins, poker chips and more. Our various POP displays range from floor, wall and counter. We work closely with ALL of our partners in the golf industry throughout the U.S. and Canada t o meet their needs both economically and materially. We have no minimum orders or requirements and we have yet to have an unsatisfied merchandiser or buyer. YOUR satisfaction is OUR guarantee! Products/Services: Girls Golf is a boutique line of golf clothing and accessories for women and teens. Products/Services: Glenayr Golf is a collection of quality men's and women's belts, hand-crafted in Canada and designed for the global market, complementing the latest fashion trends in golf apparel and every day wear. Glenayr Golf belts are available as "One Size/Cut to Fit" or assorted sizes, men's 30 to 44" and women's XS to XL. We also offer a range of product including custom logo buckles and assorted leather golf accessories that may be embossed with club or corporate logo. Visit our website to view the complete collection. The Glenayr Golf website is designed only for our valued wholesale customers, we do not sell direct to the consumer. Wholesale customers may register online, download the catalog and price list and place orders. Products/Services: Established in 1995, GOLF DATATECH was formed to provide the golf industry with specialized market research covering retail sales, inventory, pricing and distribution, consumer attitude and usage studies, and strategic sales and marketing consulting. The company is owned and managed by industry veterans John Krzynowek, Tom Stine and Phil Barnard. Products/Services: Customized golf accessories; Brass "Divot" tools, credential money clips, hand painted ball markers, key rings, and the new "Designer Hat Clip". Suppliers of all your tournament needs. Products/Services: Golf Digest is the #1 most widely-read golf publication in the world and the authority on how to play, what to play and where to play. Golf Digest's aim is to enhance the enjoyment of all facets of the game - making its readers better players, smarter consumers and more discerning travelers, while also offering the kind of informative and provocative stories that fuel the unending conversation that is golf. Products/Services: Golf professionals, merchandisers and buyers #1 source for selling excess inventory and trade-ins. Qualifying items include: Demos, fitting carts, overstocked golf clubs, overstocked apparel, accessories and more! Products/Services: Golfino offers the finest quality golf apparel blending elegant fashion in coordinated outfits and high tech function at a competitive price. Products/Services: Golfweek is a weekly consumer and trade golf publication. Golfweek's mission is to enhance the enjoyment and understanding of golf by applying the highest standards of journalism to coverage of the game. Golfweek strives to be the most comprehensive, authentic and authoritative voice in golf, delivering news and information about competition, business and the golf lifestyle - and doing it with frequency and flair. Products/Services: "Give the Trunk Show experience to your ladies (members and guests). Gramercy Atelier makes bespoke apparel for women with a focus on special occasion dressing. Not offered in retail stores - exclusive for golf clubs. The Golf Club receives commissions at the end of the trunk show." Products/Services: Greenleaf Golf Sandals from Fort Myers, FL are the #1 ladies Golf Sandals on the market today. We built the brand listening to you - our loyal customers. Our focus will be on what our customers want. We listen to your feedback in order to serve you the BEST! Our sandals are FASHIONABLE, AFFORDABLE AND COMFORTABLE! Products/Services: Affordable Fashion and Luxury. Collection includes lifestyle inspired classic and fashion styles in color stories with great layering pieces. Products/Services: Iconic Sport offers innovative, thoughtfully designed and carefully constructed sun protective apparel and accessories. Our industry-leading unisex sunsleeves, leg coolers, sun shrug, gaiters, sun gloves and other sun protection accessories, and our performance women's golfwear and activewear perform with style and comfort on and off the course. Our non-chemically UPF 50+ products are designed and manufactured in the San Francisco Bay Area using luxury performance fabrics since 2006. Products/Services: Idil Tarzi offers a tailored sun safe ladies golf attire reinterpreting the very versatile golf classics. Visit our website to meet the new golf attitude for the contemporary golfer who may wish to be more stylish and much more feminine on and off the golf course. The 'Golf&Apres Golf Chic' styles come up with highly technological, fine fabrics of ISO 105 performance accreditations. Idil Tarzi ships online retail worldwide. The AGM buyers are invited to use the friendly web page to order online for their stores. As well, the designer can be reached directly by email to idiltarzi@idiltarzi.com. Products/Services: Full service line of men's and ladies headwear, T-shirts and other accessories. Custom art & decoration in all categories including sun protection and premium technical offering. Products/Services: Since its first collection in 1997, J.Lindeberg has successfully combined fashion and function. The Company's main collection and its progressive golf and ski collections are sold worldwide in more than 25 countries including the USA, UK, Scandinavia and Japan. J.Lindeberg flagship stores are located in Stockholm, New York, Los Angeles, Miami and Copenhagen. Products/Services: Jack Grace makes the coolest golf shoes - ever-stylish, comfortable and customizable with saddles that change in seconds. Products/Services: Battle Boredom! Jamie Sadock is all about fashion and function.The latest fabrics, designs and colors.We pay very close attention to details and fit.We are at the forefront of fashion for both golf and sportswear.We offer a fresh new group every month of the year which keeps the retailers floor always exciting and new. Products/Services: Supplier of unusual sculptures, etched crystal, pewter, gifts, clocks and unique tee prizes including travel bags, shoe and valuable bags. Products/Services: The JL journey began in 2011 when a few friends had the vision to add style to one of life's everyday essentials. Socks that lasted over time were dull and boring while others sacrifice quality as a cheap thrill. Our idea became JL The Brand, a luxurious collection of American-made socks that will keep your feet looking and feeling as sharp as you. Products/Services: Founded in 2001 by Creative Director Joe Dahan, Joe's redefines everyday style with its inherently LA sensibility and distinctive rock + roll point-of-view. Products/Services: Jofit is an exciting line of athletic golf, tennis and fitness wear. An updated, more athletic fit includes: stretch top garments that are longer for a big swing and more coverage. Stretch bottom garments are a more comfortable fit with a wider waist band for a slimmer appearance. Products/Services: johnnie-O is a branded lifestyle apparel company founded in Santa Monica, CA that embodies living your best life. Its blend of Southern California lifestyle coupled with East Coast tradition and Midwest grit creates a truly distinct point of view within the lifestyle apparel industry. Well played, johnnie-O. Products/Services: Jonas Software provides enterprise club management software to over 3,500 clubs worldwide in 15 countries. Our vision to be the global leaders in club management software is made possible by our commitment to technology, innovation, quality and client service. Products/Services: Just4Golf Accessories is a fun, affordable and mix and match line of fashion golf club covers for all golfers! We design them, you combine them! Products/Services: Kaeli Smith manufactures golf apparel and accessories in original custom prints by artist and designer Kaeli Smith. Products/Services: Inspired by women with busy lifestyles Katherine Way is designed to be easily elegant for any occasion. Our "Wear Anywhere" style graciously fits and flatters every figure! With colorful and vibrant fabrics, we specialize in dresses, pants, golf skorts and tunic tops that are proudly made in the USA. Winner of the PGA Top Buyer's Choice Award and participant in the US Open Merchandise tent since 2016. Products/Services: KENTWOOL is a 170 year old family owned business located in Greenville, SC. We have long been the manufacturer of fine wool yarns for other high quality retailers. In February 2009 we began retailing our KENTWOOL performance enhancing golf sock which is 100% USA made. Products/Services: Suddenly the clothes are the fun part. Meet KINONA. KINONA provides active women with flattering, modern and feminine golf apparel that enhances her ever-evolving shape. Kinona Golf and Life are the perfect clothes and accessories from the course to the grocery store, or lunch or any other destination making your busy life easier. Luxurious Italian fabric, built in shaping, UV Protection and easy care. Products/Services: We make the best pants and shorts in the world! It fits the daughter, mom and grandma! And that's a miracle! Products/Services: Fine art and Graphic art services. Lee Wybranski Art & Design current offerings include paintings and fine art prints as well as tournament pieces. The graphic art department offers logo design and printed materials such as scorecards, yardage books and brochures. Products/Services: Levelwear: Where life and style become one. Featuring a traditional golf apparel collection of polos, mid-layer and outerwear, a casual lifestyle collection of tee shirts and sweatshirts and a full headwear and accessories collection. Levelwear is the premiere resource for customized, club logo apparel and accessories in the golf industry. Linksoul: John Ashworth & Co.
Products/Services: Linksoul: John Ashworth & Co. is a sophisticated yet relaxed combination of modern and timeless clothing and accessories. Linksoul is more of a philosophy than a brand. It is the collective life's work of a group of people that care about each other and enjoy collaborating. We believe in making things with our hands, with the people we love, for the good of our families and our surroundings. We come from a long line of golfers, craftsmen and artists. It is our idea that through these practices we can learn the most about ourselves. The word "linksoul" comes simply from the term "links soul", which was an expression of the combination of virtues we found through playing golf… and now seek in whatever we do. Our mission is to reconnect people to the soul of the game. Products/Services: The original designer of everyone's FAVORITE tassel earrings! Attainable luxury jewelry with a preppy aesthetic from the Main Line. Products/Services: Golf accessories, tournament and corporate gifts. Lorente Golf specializes in tee gifts, member guest and custom products. These products include custom bag tags, divot tools, ball markers, luggage, key tags, towels, lapel pins, name badges, money clips, locker plates, awards, etc. Products/Services: Lucky In Love manufactures luxury fashion apparel for the golf and tennis industries. Based out of Miami, FL., Lucky In Love is known for their bright colors and unique, bold prints. Products/Services: Established in 1990, Martin Dingman Leathergoods specializes in the finest men's belts, footwear, small leathergoods, gloves and bags. Products/Services: Inspired by the beauty and spirit of the Hawaiian Islands, Maui Jim manufactures the finest polarized sunglasses, combining PolarizedPlus lens technology with exquisite fashion. Products/Services: Mayva K Collection offers fashionable, affordable and high quality handbags, totes, scarves and gloves as well as gifts and accessories for the active lifestyle market. We focus on great customer and warranty service. Products/Services: The Mizzen and the Main are the driving forces of a sailboat, harnessing the power of wild ocean winds to propel its captain forward, just as our use of advanced performance fabrics have thrust traditional menswear into a new era. We have broken the chains of your wardrobe by combining the comfort and flexibility of your favorite athletic gear with the fit of a custom dress shirt and style of a Kennedy. Mizzen and Main's mission of disruption has made waves in the apparel industry, making us a fast favorite among professional athletes. Products/Services: Women's apparel that elevates style in every game - from the golf course to the concourse. These "go to" essentials are designed and detailed for a feminine athletic aesthetic. Add power to your game on the fairway and off....Dress Movetes. Products/Services: The National Club Association (NCA) has been the advocate for the private club industry in Washington, D.C., for more than 55 years. As the voice of private clubs on Capitol Hill, NCA ensures that club concerns are forefront when legislative and regulatory issues affecting the industry are being decided. In addition, NCA provides club leaders an outstanding array of resources on club industry trends, governance best practices, legal and operational matters and ways to strengthen club leadership. Products/Services: A membership-based organization providing information and insights on the business of golf and well-known as the provider of the premier databases of courses, retailers and consumers (golfers). The NGF serves the leading businesses in every golf industry sector including equipment and apparel manufacturers; media; courses and ranges; retailers; associations, maintenance suppliers, technology companies and multi-course owners & operators. New Era Cap Company, Inc.
Products/Services: The National Golf Course Owners Association, representing more than 3,000 golf courses, is the only trade association devoted exclusively to promoting the interest of golf owners and operators. Products/Services: Supplies the golf industry with golf clubs, balls, footwear, socks, spikes, gloves, bags, men and women's apparel, outerwear, headwear and eye-wear. Products/Services: At Nivo, we empower active women to embrace style without compromise. Vibrant and confident, our performance-oriented designs are fashion focused and always on trend. Designed in Montreal, we offer European influenced styling available is sizes 0-16 and XS-XXL. Our Miami, Florida warehouse offers quick shipping and embroidery capabilities to all USA and select international accounts. Products/Services: Ofelia T offers a range of fine leather products designed and handmade to attract users with an eye for quality and style. The collection is synonymous with style, quality and innovation. The creative spirit within its young design team places Ofelia T as one of the major European manufacturers of leather products, Italian quality leather and artisan Spanish manufacturing, to bring to the golf industry the ultimate in leather products. Products/Services: OGIO makes the world's most uniquely innovative golf bags, backpacks, duffel bags and travel gear. Through unrivaled technology, ingenious design and unparalleled quality, OGIO empowers the ambitious and discerning adventurer to maximize his or her potential. Products/Services: One Putt Designs offers a complete line of ladies golf jewelry and accessories. Our "Top Buyers Choice" award winning Ball Marker Ankle Bracelets are a unique product for your shop or for a ladies golf tournament gift. We just introduced a handcrafted leather ball marker cuff bracelet, in addition to our earrings, necklaces, golf zipper pulls, golf wine charms, & stroke counters. Let our design team customize you next tee gift...we promise the ladies will love them! Products/Services: Ouray designs and decorates high quality sportswear and headwear for the golf and resort markets by combining superior construction and innovative fabrics with a wide variety of graphic vibes and decoration techniques to deliver proven sellers complete, on time, and supported by five day reorders. Products/Services: The Oxford Group manufactures and distributes both the Oxford Golf® and Oxford America® brands of golf apparel. Oxford Golf® is recognized as trusted, traditional golf apparel for the sophisticated gentleman. The pure-performance Oxford America® brand is a high-value collection of performance apparel for both men and women. Products/Services: Luxury Lifestyle Sportswear for Men & Women, along with full range of Crown Sport Technical Wear for Golf and active sports. Winner of AGM Top Seller Men's (Private) since 2010, Peter Millar has limited, focused distribution in private clubs, resorts, specialty retailers, and free standing Peter Millar retail stores. Products/Services: The official trade publication of the PGA of America which is sent to every PGA Professional every month. Products/Services: In partnership with The PGA of America, PGA Worldwide Golf Exhibitions organizes two influential worldwide golf business gatherings in the United States each year: The PGA Merchandise Show, held each year in January in Orlando, FL and The PGA Fashion & Demo Experience (formerly the PGA Expo) held each year in August in Las Vegas, NV. Internationally, PGA Worldwide Golf Exhibitions supports Reed Guanghe Exhibitions and works in partnership with the PGA of America and China Golf Association to organize: The China Golf - PGA Merchandise Show in Beijing; The Asia Golf - PGA Merchandise Show in Shenzhen; The new China Golf Industry Expo; The new Asia Golf Congress. Products/Services: Now designed in-house and corporately managed and distributed by a team dedicated exclusively to apparel, the new PING Apparel is inspired by golf and our heritage. The premium line is engineered to be aesthetically pure, performance driven and tailored for the modern game. Products/Services: PING is a family-owned company founded in 1959 by Karsten Solheim, who pioneered custom fitting in the late 1960s and set numerous industry standards in the areas of engineering and manufacturing golf equipment. Today, PING is synonymous with innovation, quality and service in the world of golf. Products/Services: POPTICALS makes the highest quality Sunglasses for active outdoor athletes. Through an award winning and multi-patented design, POPTICALS provides the highest quality sunglasses while protecting the glasses and lenses when not being worn. POPTICALS has partnered with the world-wide leader in optics - Zeiss - on Nylon lenses, which offer the clarity of glass at a fraction of the weight. Popticals ensure your eyes are you biggest asset - from the tee box to the green. Products/Services: PRG is built upon a growing reputation for producing innovative, high-quality products. PRG is fast becoming the leading name worldwide for customized golf accessories. PRG uses your brand on our products. With unrivaled choice, quality and service, PRG is the one-stop-shop for all your customized golf products. Products/Services: Quality tournament prizes in every category and price range: pewter, crystal, silverplate, handsome traditional golf statues; engraving and etching your custom logos on all. Products/Services: Procraft Heritage Creations is a leading company in the design and manufacturing of custom golf shop, and specialty clubhouse millwork. We partner with you to design and manufacture the finest golf shop tailored to fit within your budget. We offer the following programs: golf shop design, specialty millwork, temporary golf shops and fixtures. Our experience insures a highly functional shop that supports your merchandising and operating programs. Products/Services: Serving golf professionals since 1983, ProTag manufactures and distributes directly to the industry a full line of bag tags: picture, plastic, paper, metal, wood and leather varieties. We also stock P-Touch labelers and replacement tapes. Our Bag Tags are Made in America. Products/Services: Protect Your Tail is bringing golfers the most stylish, comfortable, year-round sun protection experience. Our brand blends highly sustainable bamboo UPF 50+ fabrics with classic fashion for men and women that performs well from the high desert to high humidity. Founded by a mom on a mission to end skin cancer "one tail at a time," 10% of every sale goes directly to our non-profit partner, AIM at Melanoma. Colors and cuts inspired by the beauty of Tahoe and the outdoor enthusiasts who enjoy her. Products/Services: Pukka Inc. is a designer and manufacturer of premium custom golf headwear and apparel. We are best known for its fully custom capabilities, product design, embellishment quality, unrivaled fit and program flexibility. Pukka's Custom Headwear Program features industry-low minimums, no set-up fees and unmatched flexibility by the dozen. Be Original! Products/Services: Q.E.D. Style offers new, fashionable golf apparel that is compared to other designer brands. "Western" style golf shirts. All apparel is designed by a former young tour player and his experiences as a player. All items are designed to look great in any environment, not just the golf course. Now offering polos, shorts, trousers, sweaters, button down shirts, t-shirts, hats and other accessories. Products/Services: At Ralph Lauren Corporation we offer a full lifestyle golf brand. What began forty years ago with a collection of ties has grown into an entire world, redefining American style. Ralph Lauren has always stood for providing quality products, creating worlds and inviting people to take part in our dream. Products/Services: Founded in 1985, Revo quickly became a global performance eyewear brand known as the leader in polarized lens technology. Revo sunglasses were first created by utilizing lens technology developed by NASA as solar protection for satellites. More than three decades later, Revo continues to build on its rich tradition of technology and innovation by offering the clearest and most advanced high-contrast polarized eyewear in the world. Products/Services: Robert Graham represents the American Eclectic lifestyle brand-where craftsmanship, luxury and style intertwine. As a true design house since 2001, we've been inspiring fashion by developing unique garment-making techniques and complex textile patterns. Our creative seasonal collections encompass: men's sportswear, premium denim, footwear, outerwear, loungewear, accessories, and women's sportswear. With eye-catching mixed fabrics, one-of-a-kind trims and stunning embroideries, Robert Graham embodies luxury at its finest. Each product is unique, character-filled and distinctly Robert Graham--with "knowledge, wisdom, truth" embedded in each garment. Products/Services: As manufacturers of the world's most luxurious golf footwear for men and women, we believe it's about the finer details that make our golf shoes so special. Each golf shoe requires more than 250 tasks and over 70 hours of precise Italian craftsmanship. Much like our shoe makers, we know our customers make time for the essentials, appreciate quality and value culture and tradition. Royal Albartross Golf Shoes are both beautifully styled and technically advanced. All the way from Italy with a touch of British class just for you. We believe in close relationships and supporting retailers wherever possible. We also pride ourselves on excellent wholesale and customer service, making the Royal Albartross experience pleasurable from purchase to play. Products/Services: S. Walter Packaging Corp was founded in Philadelphia, PA in 1904, since then our family business has been providing the retail industry with packaging supplies, services, domestic distribution and over a hundred years of expertise. Our tradition at S. Walter is to provide every customer with genuine customer service, superior products for every retail packaging need and competitive pricing, all while attentive to our "Green" initiatives to help our environment offering a wide scope of eco-friendly alternatives. S. Walter understands that your brand and services are the most important message you want to convey to your target market. We provide packaging solutions from traditional to custom and domestic distribution throughout the whole process. Products/Services: SanSoleil offers women's and men's "Skin Care You Can Wear..." SanSoleil garments sport the highest SPF achievable for the fabrics chosen. They perform with sun protection wash after wash. SanSoleil has added a soft, stretchable, breathable nylon mesh under each sleeve to promote comfort by the simple, yet effective aft of air flow. Products/Services: Scout Sports is a golf and sports apparel company for men and women. With a sleek and modern style, our products are designed to work well on and off the course. All products are made with high-quality tech fabrics and are made in the USA. Products/Services: Signs By the Sea LLC, founded in 2011, manufactures and sells wholesale custom, hand-crafted signs and products. All products are Made in the USA at our production facility located in Wall, N.J. All Signs By the Sea products are made from wood and finished by hand to have a weathered, vintage, beachy feeling. Products/Services: Sligo Wear, founded in 2004, produces trend setting men's golf apparel. Our golf authentic brand blends the trends and fits of North American and European fashion together with the technical fabrications a golfer needs. Products/Services: Smathers and Branson offers 100% hand-stitched needlepoint belts and accessories. Products/Services: Southern Tide - we're all about the CLASSIC AMERICAN LIFESTYLE: road trips across the country, quality time with our four-legged best friend, and low country boils on the coast. We have an affinity for all things BLUE, but we still live a COLORFUL life. From our wardrobe to our personality, we don't shy away from making a statement for men, women and kids. Products/Services: Shop accessories (bag tags, divot tools, ball markers, umbrellas, tee prizes, towels); supplies (tees, pencils); retail packaging (bags, boxes, giftwrap); and tournament gifts. Products/Services: Sterling Cut Glass offers custom etched crystal trophies, awards and tournament gifts. We also offer custom engraved metal trophies and gift items. There are many options for retailers including barware, stemware and gift items. To request a catalog please call 800-543-1317 or email cs@sterlingcutglass.com. Products/Services: Stitch Golf strives to be the only company you will see with such precise attention to detail, all the way down to the last stitch. Stitch aims to produce the best quality, the greatest fit and the most functional products to supply customers with the finest in the industry. Stitch products have evolved over time from the original leather headcover to now offering a variety of bags such as lightweight golf bags and the unique ultimate garment bag (UGB™). Stitch prides itself in the details, paying attention to high quality exclusive materials including durable waterproof fabrics, fashionable color schemes and even personalization designs completed in house at their headquarters in Cary, North Carolina. Stitch Golf expanded their product line to include apparel with the acquisition of Martin Fennec at the end of 2017. Stitch found an incredible team at Martin Fennec with a matching culture and tremendous design, product, embellishment and distribution expertise to add to the existing Stitch team. It has been a fantastic marriage between the two teams. The Martin Fennec apparel line will be known as "Fennec by Stitch". Products/Services: A complete selection of golf-related apparel specializing in distinctive, lifestyle-driven outerwear for both men & women. Products/Services: Sunice golf products incorporate the essentials of golf outerwear, including featherweight fabrics and noiseless garments that allow for full-range of movement and protection against the elements. Products/Services: Swing Control is the perfect bottom to your tops. We offer the unique blend of fashion function and fit. Our fresh color palettes, distinctive prints and hidden tummy control keep you looking your best, both ON AND OFF THE COURSE. We are undeniably the ultimate in function athletic luxury. Swing Control, it's a lifestyle. Products/Services: For over 40 years, Tail Activewear has been bringing the best in fit, fabric, and fashion to the world of women's active apparel. Today, we are still just as committed to delivering the fashionable styling, dependable sizing and the latest in performance technology and technical fabrications our customers have come to expect. Products/Services: Tee 2 Sea has designed the golf dress that goes everywhere! Committed to quality, style, sensational prints and the environment with fabric content of 84% recycled water bottles, it is dry wicking, anti-microbial and made in the USA! Products/Services: Since 1946, Tervis Tumbler has manufactured insulated tumblers that keep hot drinks hotter, cold drinks colder and are completely customizable. Tervis prides itself on high quality & durability and stands behind their products with a comprehensive lifetime guarantee - upholding the same high standards of craftsmanship and customer relations today, as it has for decades. Products/Services: The Game Headwear is a provider of high-quality headwear. Driven by creative custom designs, low minimums and quick turnaround . The parent company is MV Sport based in New York. Products/Services: Premium wooden golf ball markers are bespoke solutions for golf outings, corporate giveaways, personalized gifts and engraving, and more. Products/Services: An inflatable pillow enclosed in a soft water-resistant neoprene sleeve, TheraPouf is made in the U.S.A. and designed to help with pain and inflammation from golf, tennis or daily workouts. It comes with a gel pack, which you can insert into a pocket for hot or cold therapy. Used as a pillow, or wrapped around painful joints and limbs, TheraPouf helps prevent and treat back pain, neck pain and joint pain. Products/Services: Leather duffel bags, garment bags, briefcases, backpacks, toiletry cases, totes, shoe bags, portfolios, billfolds, tablet covers, tech organizers, pouches, scorecard covers, luggage tags, journals and more. Items are offered in leather and leather/canvas. No minimums, fast turnaround and debossing with your company logo. Products/Services: Since its 2003 incorporation, Tifosi Optics has been developing technologically-advanced, value-oriented eyewear for enthusiasts of all sports and offers an extensive line of golf-specific products including standard golf-specific lens tints and new golf-specific Fototec photochromic lens tints. Products/Services: Tin Cup is a golf ball marking stencil that enables the golfer to mark their golf ball with a choice of over 150 designs. Products/Services: Performance activewear by Tory Burch, inspired by the grace and strength of athletes. Tory Sport balances style with substance, and is designed to reflect the beauty of the game and the empowering role that sports play in all aspects of a woman's life. Products/Services: Tournament Solutions distributes high end gifts, awards and accessories to country clubs and golf associations. Products/Services: Men's and women's caps, visors, straws, and accessory items -- domestically manufactured and imported styles -- in house tape development and embroidery operations. Products/Services: Fun and functional apparel for junior golfers on and off the course. Products/Services: Under Armour has teamed with GEAR FOR SPORTS to bring its innovative performance apparel to a wider range of athletes in the golf market. Under Armour's core product lines feature golf-logoed apparel, including HeatGear®, ColdGear® and AllSeasonGear®. These products are constructed with Under Armour's patented moisture-management fabrics that are guaranteed to keep golfers comfortable and dry. Products/Services: The industry's leading source for event business, basic programs and staff uniforms, Vantage currently provides unique apparel opportunities for more than 2000 pro shops and resorts. Vantage apparel has been featured at major golf tournaments and events nationwide including the John Deere Classic, US Tennis Open and NYC Marathon. Private label and custom apparel programs let customers create unique products and branding. Our in-stock collection offers fashion & basic apparel with aggressive opening price points and low minimums. Our core product categories include polos, wind shirts, fleece and outerwear. Products/Services: Our modern, handcrafted collections hit the perfect notes of style and cause. With each bag purchased, Vessel gives a school backpack to a child in need, helping them get the education they deserve. You're not just buying a bag, you are buying a vessel of purpose. Products/Services: VGM Club is the nation's premier member service and marketing organization for membership-based clubs, including golf, tennis, yacht, city, athletic clubs, resorts and gaming facilities. Products/Services: Celebrate Your Heritage with Coins! Vintage Coin Concepts has developed a unique line of products that incorporate original vintage coins in functional products like ball markers, divot repair tools, headwear, leather goods, glassware and accessories. Depending upon when your club or course was established we might use a genuine Indian head penny or Buffalo nickel in your products. Products/Services: Men's golf apparel and accessories. Products/Services: Wallaroo Hat Company was founded by Stephanie Carter and Lenya Shore in April 1999. after they discovered the Aussie secret to sun protection with style: colorful UPF 50+ crushable fabric hats. The complete collection includes 42 distinct styles in solid, brightly colored fabrics, as well as tropical prints and neutrals. Canvas, loose weave, microfiber, cotton twill, poly-braid, and polystraw make the Wallaroo Hat Collection washable, crushable and versatile for everyday work or play. Wallaroo Hat Company has been committed to making charitable contributions over the past ten years. Products/Services: Weatherproof offers a fine collection of tailored shirts, sweaters and outerwear. The use of technologically advanced material and classic styling makes us a unique outerwear company. MV Sport is a collection of graphic driven items; i.e. blankets, sweats, t-shirts, MV Sport, known for unique packaging concepts and tournament gift items. Products/Services: Created for women who love the unusual. Patented sunflower headcover designs in brightly colored patterns create a garden in your bag. Using Sunbrella fabric, they are water and sun resistant. Great for personal and event gift giving. Logo availability. Products/Services: Custom logo belts and accessories made with woven ribbon and/or custom conchas. Logos available in silver, wood and leather. Products include hats, tote bags and ties. All products are customized.